In this second segment of our exploration of the Exponential Curve, we'll consider the explosion of knowledge, transportation and communications. 2) Knowledge — Another area that is increasing exponentially is knowledge. The prophet Daniel was specifically told that knowledge would vastly increase in the end times (Daniel 12:4), and it has. In fact, we have become so overwhelmed with the flood of new information that it is difficult to find wisdom anymore, because wisdom comes from reflection on knowledge. It is estimated that 80% of all scientists who have ever lived are alive today. Every minute they add 2,000 pages to man's scientific knowledge, and the scientific material they produce every 24 hours would take one person five years to read.7 The scientific journals cannot publish all the academic articles that are being written. Many have to limit the articles to one page abstracts, and even then most articles are rejected for a lack of space. Today, knowledge is doubling every 12 months! The most amazing thing to me in the area of information is the World Wide Web that can be accessed through the Internet. Using it, I can access the documents of the Vatican in seconds, and then in a matter of moments, I can go to the Israel Museum in Jerusalem, or I can dart back to the Library of Congress in Washington, D.C. In short, I can access information all over the world without ever leaving my office. 3) Transportation — In 1900 the major means of transportation was what it had always been throughout history — namely, walking and riding a horse. The bicycle had been invented, and the steam engine had been applied to ships and trains. But steam powered transportation was too expensive for most people. 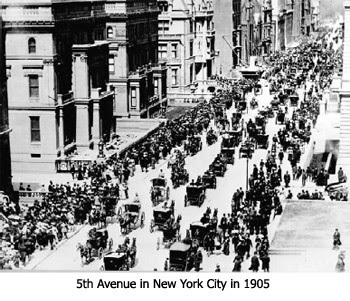 Below is a photograph of 5th Avenue in New York City in 1905. As you can see, the only means of transportation visible is the horse-drawn carriage. I have a similar photo that was taken in my home town of Waco, Texas in 1912. It shows the city square, and like the photo above, all that can be seen are horse-drawn wagons and carriages. Today we have automobiles (usually two or more to a family!) and airplanes. We have bullet trains that travel 150 miles per hour and planes that travel faster than the speed of sound. And then, of course, there are rocket ships that take astronauts into orbit around the earth. In 1866 Mark Twain traveled to the Holy Land. It took him three months to get there. Today, a group can get on a jet plane in New York and be in Tel Aviv in 13 hours (and most will complain about how long the trip took!). During the 19th Century, the average number of miles traveled per year by a person in the United States was 500. Many lived and died and never got outside the county they were born in! By 1900 the average number of miles traveled per year by a person inside the United States had risen to 1,000. Today it is 25,000 miles per year, and many of us put twice that much mileage on an automobile in a year's time. 4) Communications — At the beginning of the 20th Century the telegraph had sped up communications considerably, and the telephone had been invented. But the fundamental means which most people used to get information was still the newspaper. Today our communication resources are overwhelming. We have telephones, radio and television. We have exotic devices like fax machines, pagers and cellular phones. And we can communicate worldwide through satellites. I never cease to be amazed when I see someone use a credit card at an Arab shop in the Old City of Jerusalem. The shop may be nothing but a primitive hole in the wall, but over in some dark corner there will be a machine where the merchant can swipe the card. A few moments later he receives an authorization. During those few moments, the card number has been transmitted to Tel Aviv, from Tel Aviv to New York by satellite, from New York to the credit card processing center somewhere in the States, and then back to the Arab shop in Jerusalem! Once again, we have the exponential curve. 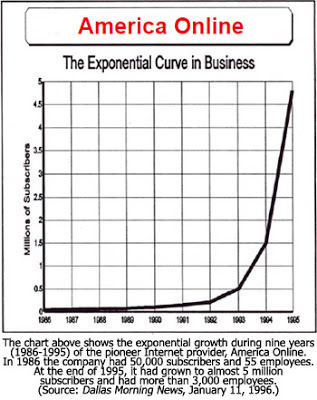 In the third segment of our exploration of the Exponential Curve, we'll look at more examples and consider the explosive growth of computers, military power and violence. 7) Seven-Minute Sermons, "Sustainable Knowledge at Work," http://sevenminutesermons.wordpress.com/2012/02/17/sustainable-knowledge-at-work. 9) Julie Bosman, "After 244 Years, Encyclopaedia Britannica Stops the Presses," The New York Times, March 13, 2012, http://mediadecoder.blogs.nytimes.com. 10) Oakton Community College 24/7 Library Research guide and Webletter, "Are You Information Savvy?" www.oakton.edu/user/4/jmayzel/247/savvy.htm, page 1. 11) Sam Nurmi, "Internet 2011 in Numbers," http://royal.pingdom.com/2012/01/17/internte-2011-in-numbers, page 4. Pg. 74 The Jews pray for the destruction of the antichrist. Let his posterity be cut off"
And yet I've read Dr. Reagan saying the antichrist will be a homosexual. Can you please explain that considering the verses above? Thanks if you have the time to respond. Daniel 11:37 " Neither shall he regard the God of his father nor the desire of women nor regard any god; for he shall magnify himself above all." This does not mean no desire FOR women but rather means he does not desire the long awaited Messiah which was the desire of the Jewish women to be the mother of the Son of God. It is really about his distaste for all that is Truth. I have read that it was the Catholic church.. but then they seem to be fighting Obama on the health care bill. And of course as all religious sects,, there are some good and some bad.. so do you think it might be when he calls us to take us home? Anon, i think that passage is referring to us... his people... being called to be separate from sinful society. ..... do u know where the bible says (something like).... that the testimony of Jesus is the spirit of prophecy?? Susie.. it is Rev 19:10. I meant when you click on the site, then click on the group of HERE that are in purple.. then the next page hit the King James and all the books and verses are on one page. Here is one some of you might like.. it shows scientific things in the Bible.. and shows the verses, and also the year of century that Man discovered it.. when it was always in the Bible..
i absolutely LOVE to go deeper in my study of the WORD! Praise God! ..someday i will thank u with a holy hug right there in person! Anon said "...The Earth is round Isaiah 40:22 realized by man in the 15th Century..."
Sorry Anon, incorrect! That's "The Flat Earth Myth Again"
Susie, have you ever heard people say that God's time is not the same as Ours and try to use that for the Earth not being built in 7 days..
Well the other day, it hit me when I was reading it.. after each creation, God says: And God called the light Day, and the darkness he called Night. And the evening and the morning were the first day. every time he creates he states that the evening and the morning was the 2nd day and so forth. NO way to say it took millions of years..
Anon, i totally agree. Have u ever heard of hugh ross? He has a program called reasons to believe. Ultra intelligent scientist .. christian.. he is so awesome but subscribes to the old earth thing. Reading your request, I reciprocated! This guy has done a fantastic, monumental work from a strictly scientific perspective! It is written so that the average lay person can understand it, but with plenty of page-links to tons of the scientific data. How the data from the 3 main branches of science; the life sciences, the astronomical - physical sciences, and the earth sciences disproves evolution and supports creation. The Hydroplate Theory - How the Earth explosively fractured from the North pole to the south, creating the Atlantic ocean and dividing the continents. Thank u so much for taking time to help educate! ! I am noting these references ..
Billy, Daniel 11:37 explains the Antichrist will "show no regard... for the desire of women." This has been interpreted a number of ways, such as he could be totally indifferent to relationships, that women desire Christ and so he will not (a weak argument in my opinion), that he will be abusive to women, or that he will shy away from women and be attracted to men. Since the Antichrist is the Anti or opposite of Christ, then he will pervert the natural order of things. Plus, with his timing coming from the rise of acceptance for homosexuality, it seems to me the most logical interpretation of this verse is that the Antichrist will be gay. I can't be dogmatic about that, of course, but it seems the most probable of the different interpretations. Psalm 109 isn't prophesying that the Antichrist will one day have children, but giving a standard curse from that time period that one's family line is cut off. Anonymous, concerning coming out of Babylon in Revelation 18, the timing during the Tribulation of the Antichrist's empire precludes the Rapture from taking place during that time. The Church would have come out of the world at the Rapture before the Tribulation began. Most likely the reference of coming out refers to the Tribulation Saints getting out of town before Babylon's destroyed - "In one hour your doom has come!" (verse 10). Thanks for the reply. I suppose another explaination is he could be gay yet also married (could be legal worldwide by then) and adopt children. But I think the "common curse of the day" makes sense.